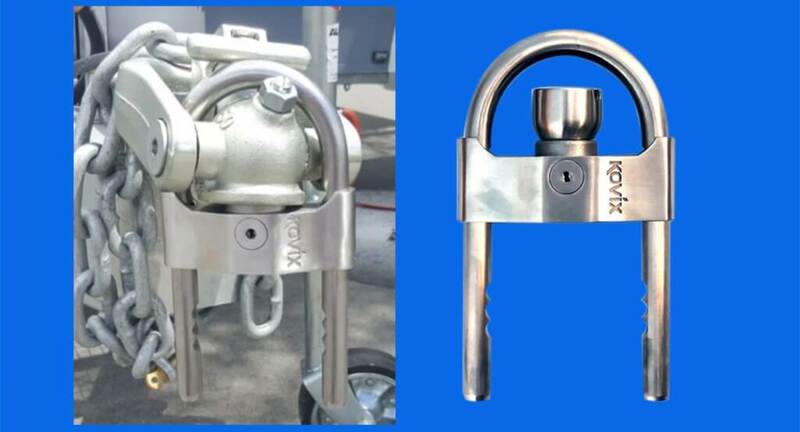 The Kovix KVH alarmed trailer U lock allows you to secure your boat, caravan or trailer. Made from high strength 304 stainless steel, this lock is designed for Australia’s tough conditions. The original KVH-88 model has now been superseded by the new KVH-96. The increased width of the new version (96mm) means it fits more coupling types. It is suitable for the following couplings: standard 50mm ball, standard 70mm ball, ALKO Offroad 3.5T and ALKO Offroad 2T. On most ball couplings, the KVH can also be locked on while the trailer is attached to your vehicle (use caution when driving with the lock attached, as extreme conditions may cause damage to the lock). Features include a built-in 120db alarm system, CR2 long-life lithium battery, on and off alarm functions and water-resistant electronics.